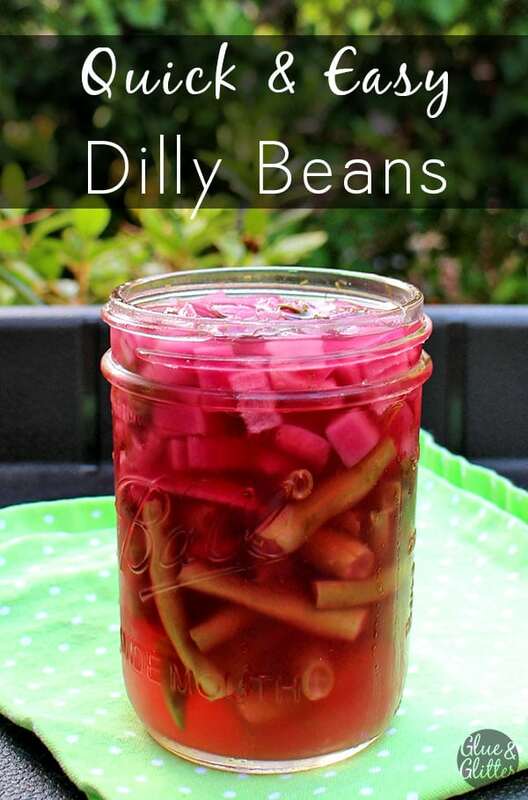 These refrigerator dilly beans are easy to make and perfect on top of salads, bowls, or to garnish your next bloody Mary. My dilly beans got their vibrant, hot pink color from the red onions! This is how they looked after 24 hours in the fridge. Remember last year when I made pickles with Darrol’s school? It was so much fun that I came back this year to do it again! 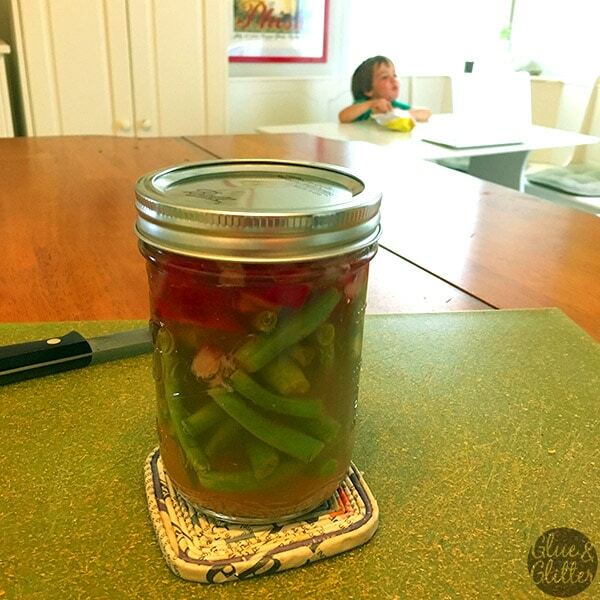 This year, we made refrigerator dilly beans, and they are such a great pickle for young kids to do. Below, I’ll walk you through some tips for making these one-on-one with a young kid. If you need directions for how to do this with a bigger group, check out my post from last year. These are refrigerator dilly means, meaning that they are not shelf-stable. You store them in the fridge, not in the pantry. They’ll keep for 3-4 weeks, but I dare you to wait that long before you demolish them! I chose this recipe because it’s super simple. I also wanted something that, unlike last year, didn’t involve too many steps that the kids couldn’t see. 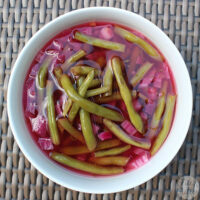 Darrol loved this so much at school that he asked me to make pickles again that same afternoon. I was so happy to oblige! Chop everything before the kid gets involved. For this recipe, that means chopping up the dill and onion and peeling the garlic. Darrol is a good kid, but at 3, he’s not quite ready to manage a knife. Let the kid snap the beans. But also be available to help out. Darrol got overwhelmed at snapping 1 1/2 cups of beans, and he focused a lot better when I was helping him. Measure, then let the kids press, scoop, and dump. Toddlers love to pour. They also love using a garlic press, though they may need some help, since their hands are tiny. Let them help stir, with supervision. When we moved to the stove, I let Darrol pull his stool up and help stir the brine. We talked about what boiling is and how you can tell its starting when you see the tiny bubbles. Who says that waiting for the pot to boil is boring? Ladle the brine yourself. This part, I totally did myself, because that brine is HOT and the jar gets very hot to the touch, as well. Older kids can help with this – you know what your kid can do! Optional last step: Let your kid Skype with a grandparent, so you can clean up the kitchen. Whether you make these with a kid or on your own, they’re really easy and fun to do! I predict a summer of making pickles with my new favorite sous chef. 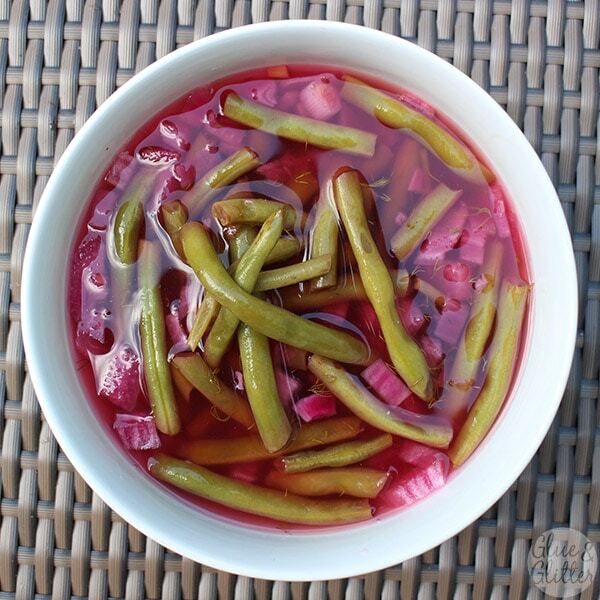 Snap the pointy ends off of the green beans, and arrange them in a 1-pint, wide-mouth mason jar. In a small saucepan, combine the dill, salt, garlic, onion, and vinegar. Heat to a rolling boil, then immediately turn off the heat. Ladle the dill, onions, and garlic into the jar, then top off with vinegar from the pan. You want to get as much of the goods into the jar before you add the vinegar, but don't stress too much about it. Cover loosely, and leave the jar on the counter until it's cool to the touch – about an hour. Refrigerate until you're ready to serve. These are best the next day, but you can serve as soon as 1-2 hours later. They'll keep for 3-4 weeks in the fridge. Love the name “Dilly Beans” These look wonderful!